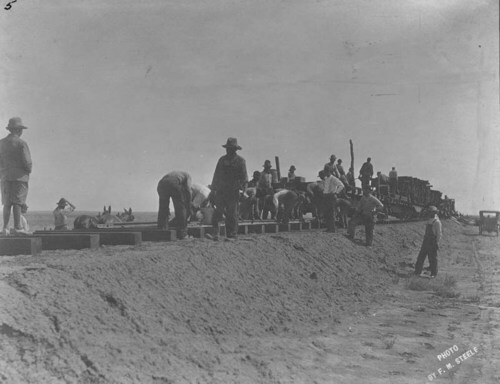 This is a view of railroad construction workers laying track across the prairie in Haskell County, Kansas. This railroad, which in 1912 ended at Felt, Oklahoma, was being extended to connect with the Santa Fe railroad lines at Colmer, New Mexico. It was expected to become part of the main transcontinental Atchison, Topeka, and Santa Fe railroad route.